There’s nothing hotter than a freshly painted Tardis. This polyester/lycra dress comes in four sizes, but unless you or your lucky Wholigan friend for whom you wish to buy this are a size medium, you’re out of luck. Currently, sizes XS, S, and L are out of stock, but have an optimistic “Sewing More :)” tacked on to the side. If you’re not crafty enough to make a Tardis costume from scratch in time for Comic-Con, or just feel like showing more skin in order to compete with the inevitable person who dresses up as the alien stripper from Total Recall, this is your best bet. Order yours here. But if they’re not back in stock by October, or if you just can’t wait to flaunt your love of all things Doctor Who, Black Milk also carries Tardis Leggings. Of course, the effect is not quite the same, but it still looks pretty cool. A Time Vortex print would be even better, but just top it off with a fez and a bow tie. 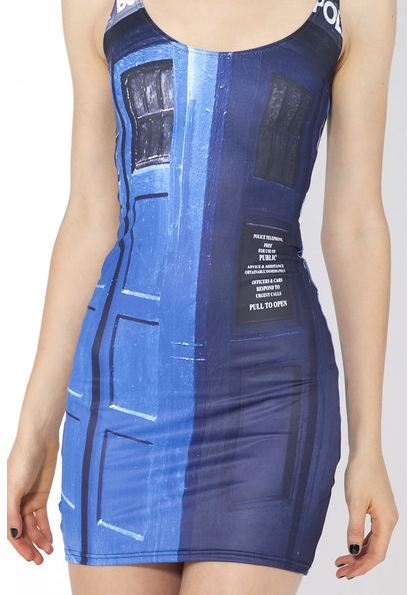 It’s a little late for Amy to showcase these amazing pieces, even though that Tardis mini-dress is totally up her alley, but cross your fingers and maybe we’ll see Jenna-Louise Coleman in a few of these. It was a bit of a stretch at the time, but boy, can we see it now. I say we bring her back as an interactive hologram as part of the control matrix….